A new senator doesn't think taxpayer-supported governments should hire lobbyists to talk to other government officials and won't let those lobbyists come to her office. But she took their contributions during her 2014 campaign. Visiting hours for taxpayer-supported lobbyists might be limited at Konni Burton’s Senate office, but the bank window was open to them when she was collecting campaign contributions last year. Burton, a freshman lawmaker from Tarrant County, doesn’t want to see any lobbyists who have been hired by tax-supported clients unless they’re coming around to talk about something else. She told her staff — and the rest of us, via news release — that those folks are not welcome in her office. Burton just doesn’t think taxpayer money should be used to hire outside professionals to lobby the state government. This, apparently, is something she doesn’t think the government should privatize. “Persons have the right to petition the government, but government doesn’t have the right to petition the government,” says Luke Macias, Burton’s political consultant. The senator was not immediately available for comment. “Government is the only entity that can coercively take money from an individual and then turn around and spend it on someone to lobby for something, whether the individual taxpayer agrees or not,” Macias said. And he says Burton is happy to meet with mayors and city employees about issues of concern — but not their hired lobbyists. This started on the campaign trail and was a popular item with some conservatives for years before Burton ran for office. 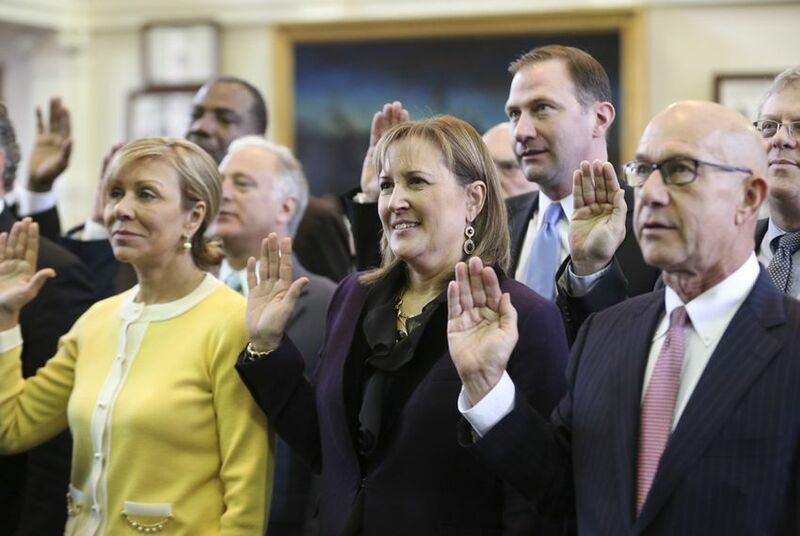 The new senator, who succeeded Wendy Davis, is the first lawmaker in Texas to make a show of her cold shoulder against the use of taxpayer money for lobbying the state Legislature. School districts do it, as do cities, counties, hospital districts — you name it. They hire specialists to talk to the Legislature because of all of the things that can happen to them if they’re not paying attention: unfunded mandates, limits on their ability to raise taxes to pay for what they do, road projects, distribution of state money for schools or hospitals or whatever. They join associations that represent their positions on general issues — groups like the Texas Municipal League, the Texas Association of Counties and the Texas Association of School Boards. That’s just three; there are loads more. But the point is that public entities — governments — send in advocates to make sure lawmakers know where they stand as those legislators are making laws and writing budgets. It’s controversial because of where they get their money. It can stick in a taxpayer’s craw to be paying one government to lobby another government — one that the taxpayer is also paying for — to do some version of the right thing. The state has an office that lobbies the federal government, but that’s a different subject for another day. Here’s the thing with lobbying: It’s protected by the First Amendment, in the part that says you have the right to petition your government. And if the elected officials at your local school district think they are about to get squashed by some nincompoop in Austin, they figure they ought to be allowed to open their mouth and holler. One way to holler is to hire a professional. Burton ran for the only Senate seat that was truly contested in last year’s general election, and both the Republicans and the Democrats spent a lot of time and treasure on it. So did some of the state’s biggest lobbyists. And they were there for Burton, and she was welcoming to them. Many of those lobbyists list public entities among their clients: The Texas Lobby Group represents the cities of Fort Worth and Temple; the Blackstone Group has the cities of Amarillo and Waco; HillCo represents Frisco. It goes on like that, with school districts, counties and other governments. Texans for Public Justice, a liberal watchdog group that’s predisposed against the conservative new senator from Colleyville, found three dozen government entities whose lobbyists contributed to her. Burton plans to keep those folks out of her office, even though several of them contributed to her campaign. It’s not that they were buying support, but you would think, as some have, that she might take their phone calls no matter who their clients were. Nope. Not when they’re speaking for government clients, anyway. But she’ll take their campaign checks, when the time comes. Disclosure: HillCo Partners is a corporate sponsor of The Texas Tribune. A complete list of Tribune donors and sponsors can be viewed here.